36' Bertram motor vessel | Christian & Co. The vessel was inspected while hauled. Hull construction material is molded fiberglass. Deck is constructed of molded fiberglass and above deck structures are constructed of molded fiberglass. Coring is unknown. Bulkheads are constructed of plywood. Overall condition of the hull structure appears in as-built condition. The vessel’s weight is unknown. Exterior rails and hardware appear satisfactory. Cosmetic condition of vessel appears good externally and satisfactory internally. Vessel’s external colors are white hull, blue/gold accent stripes, white particle nonskid decks. Below waterline through hull fittings appear satisfactory although several are difficult to operate. The aft through hull fitting has no handle. The vessel is equipped with three electric/automatic bilge pumps that appear satisfactory and the bilge is holding minimal water. The ventilation system consists of blowers and natural ventilation and appears satisfactory. General housekeeping appears satisfactory. The condition of the coring, in the stringers, deck, and elsewhere as applicable, is beyond the scope of this inspection. Engine external surfaces appear satisfactory and exhibit no significant rust, oil or coolant leaks. Engine hour gauges exhibit P – 202.7 & S – 201.4 hours. Motor mounts appear satisfactory. Cooling systems appear marginal. The raw water intake hoses (port and starboard engines) are cracked. Fuel system and components appear satisfactory. Exhaust systems and components appear satisfactory. Electrical system and components appear satisfactory. Engine control systems appear satisfactory and shaft logs appear satisfactory. Steering control systems appear satisfactory and rudder ports appear satisfactory. Propulsion components appear satisfactory. Generator surfaces and motor mounts appear satisfactory. Generator’s peripheral components and systems appear properly arranged and installed (not tested). Waste systems and components appear satisfactory. General service seawater systems appear satisfactory. There is an unknown gallon capacity in one metal tank located aft of engine room. Fuel tank surfaces, where visible, appear satisfactory and the securing mechanism appears satisfactory. The fuel fill, vent, feed and return lines and components appear satisfactory. Fuel shutoff valves were not seen. The AC shore cord, inlet and connections appear satisfactory. The AC wiring and outlets appear satisfactory. The AC main feed is protected with circuit breakers. Battery arrangement appears satisfactory. Batteries are equipped with a disconnect switch. DC wiring appears satisfactory. Circuit protection for the AC and DC branch system appears satisfactory. Wire terminations and connections appear satisfactory. Wire organization and arrangement appears satisfactory. Vessel has two portable fire extinguishers with expired certification. Vessel has one Fireboy MA2-475 fixed fire suppression system with expired certification. The safety components include: fifteen PFDs and one throwable PFD; distress flares with expired certification; one Zodiac life raft with expired hydrostatic release certification; suitable first aid kit; one anchor with chain and line and appears satisfactory. Navigational and anchor lights appear properly arranged and installed. The vessel is a production built fiberglass sport fishing boat equipped with twin diesel inboard engines. The vessel was built in December of 1999 by Bertram Yachts. The vessel was inspected while hauled only. The vessel was hauled for routine below the water maintenance, including new antifouling paint, through hull fitting maintenance, zinc replacement, etc. The ownership history is unknown. The maintenance history of the vessel is unknown. The vessel is in as built structural condition and in good cosmetic condition. No statements were taken in regard to any previous events in the vessels history such as collision, grounding, submersion, fire, etc. Upon completion of the recommendations the vessel is suitable for its intended use as a coastal sport fishing vessel. 1. The starboard forward second from outboard through hull fitting exhibit a moderate halo around the through hull fitting. Inspect and service the through hull fitting as needed/necessary. 2. All firefighting equipment seen on the vessel is expired. Provide adequate currently tagged and inspected fire fighting equipment as recommended by the N.F.P.A and required by federal regulations. 3. The visual distress signal flares seen on the vessel are expired. Provide current visual distress signal flares are required by federal regulations. 4. Both port and starboard engine intake external sea strainers exhibit significant marine growth and blockage. Service as needed. 5. The transom mounted zinc anodes are well beyond their service life. Replace as needed. 6. The anti-fouling paint is at the end of its service life. Service as needed. 7. The through hull valve seen in the aft lazarette has no handle. Provide a through hull fitting handle and prove the valve functional. 8. The drain hose for the aft lazarette removable locker well has been disconnected. Provide a proper drain for the locker well as needed to prevent accidental flooding of the lazarette/rudder compartment. 9. Both port and starboard engine raw water intake hoses are cracking and at the end of their service life. Replace the hoses as needed. 10. The port and stern navigation lights do not function. Service as needed and prove all navigation lights functional. 1. Consider the installation of sacrificial zinc anodes on the port and starboard trim tabs and propeller shafts. Service as needed. 2. The generator’s raw water sea strainer is dirty. Service if/as needed. 3. The port engine oil dipstick base exhibits rust/water stains. 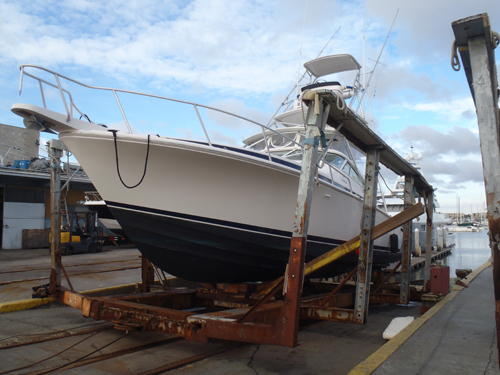 Have a qualified marine mechanic inspect and determine the cause of rust/water stains about this area. 4. Display proper documentation number on the hull/bulkhead etc… as required by federal regulations.